Euro gold rose to about €903, platinum lost $0.50 to $1413.50, and copper fell four cents to about $3.31. Gold and silver equities fell about 1.5% in the first half hour of trade and remained near that level for the rest of the day. Tomorrow brings December’s jobs data and Wholesale Inventories from November. Oil ended slightly lower in mixed trade in continued reaction to yesterday’s supply report. The U.S. dollar index initially popped higher after the ECB held interest rates steady as expected, but it then drifted back lower into the close and ended with a loss ahead of tomorrow’s jobs data. Treasuries remained higher after today’s $13 billion 30-year note auction sold at yield of 3.899% with a bid to cover of 2.57. The Dow, Nasdaq, and S&P waffled near unchanged and ended mixed. Among the big names making news in the market today were Compuware, IBM, Dish, and Alcoa. 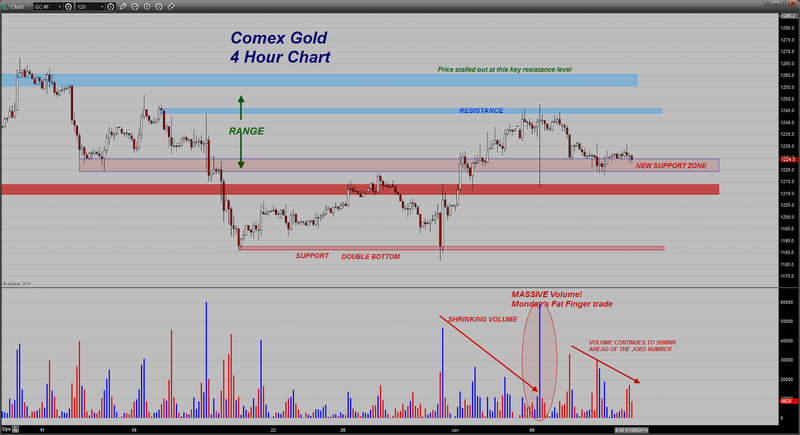 “The gold market was relatively quiet in today's session as most traders did not want to get too aggressive ahead of a major payrolls report due out tomorrow. That is when the action should pick up. It does seem to be holding support at the zone noted on the chart here. That is roughly between $1220 - $1224. Notice that once again volume is shrinking but that volume on the down bars continues to exceed that on the up bars. The bears are still in control for now. There has been a bit of weakness in the US Dollar today which is helping to bring some small buying into gold but as noted above, it is not large. The mining shares are moving lower perhaps partly in response to a Moody's analysis. I am noticing that a growing number of the larger banks and analytical firms are lowering their price forecast for gold based on the same things that I and others who read this site have been mentioning - the lack of perceived inflation pressures and the steady rise in US interest rates. Barclay's is expecting a retest of $1050 in gold later this year. Moody's, mentioned above, lowered their gold price forecast from $1200 to $1100 and also cited concerns about the health of some miners if prices move that low. That same firm lowered their expected silver price from $20 to $18. Bank of America/Merrill Lynch lowered their projected gold price 11% to $1,150 and their silver price by 21% to $18.38. You can see how sentiment in gold is being impacted. This is what I refer to when I try to explain to some that it is SENTIMENT that moves MONEY and it is these money flows or lack thereof that drive market prices. Good traders try to grasp sentiment shifts and move with them in order to profit. They do not get married to their opinions but are responsive to changing market perceptions. If you are wrong; you are wrong and you get out of a trade that has gone bad. You do not sit in it and argue why you are right! That brings me back to the lack of inflation pressures. Something of importance occurred today -corn prices notched a 40 MONTH LOW. Yes, you read that correctly. Wheat prices scored a 21 month low. Sugar prices hit a 42 month low. The Goldman Sachs Commodity Index hit a 2 month low today as a result of all this. If there are inflationary pressures building in the US economy, they are certainly not occurring in the general price of commodities, especially in the grains. The standout to this is in the cattle markets where the combination of back to back drought years in 2011 and 2012, combined with high corn prices until recently, has led to wholesale liquidation across the US herd with the result that supply is now being impacted. Throw in a dose of severely cold, record breaking temperatures, and cattle prices are very strong, record strong I might add. While consumers might get a break from the high prices for grain-based products, they should get ready for sticker shock at the meat counter. One of the things that I am beginning to do as a result of all this is to re-examine my view of what it is going to take to drive the price of gold higher. For many years now, those who were looking for stronger gold prices have been doing so based on continued weakness in the US economy. That weakness has given rise to the Fed's QE programs. The thinking has been that the longer the US economy remains weak, the longer the Fed will have to continue its bond buying program. The longer the QE program continues, the more liquidity that the Fed must provide and the more liquidity the Fed provides, the more friendly it is for the gold price. That has obviously not been the case for the last several years. Not only has gold been sinking in price, along with silver, but nearly every other commodity has as well. Large speculators realized that the Fed's program was not having the expected impact on the US Dollar and thus they rethought their reasons for having exposure to anything tangible. After all, if the Fed's programs were not generating rapid growth, then why tie up capital in a sector that was being impacted by both shrinking demand/growing supply. I am now of the opinion that those who want to see higher gold prices had best be cheering for STRONG PAYROLL NUMBERS and not weak ones. They had best start cheering for shrinking unemployment numbers based not on a shrinking labor participation rate but rather on real hiring. They had best start rooting for increases in consumer spending noted in retail sales and increases in overall consumer credit. They had best cheer for strong PMI Numbers whether manufacturing based or service based. In other words, if two + years of QE has not produced inflationary pressures because of the structural issues in the US economy then why would another year, or two years, or even five years, do anything? It will not in my opinion. What is necessary for gold now to recover and begin to trek upwards in sustained fashion is inflation or more accurately, the fear or concern of inflation building into the economy. That is not going to happen until WAGES RISE and wages are not going to rise as long as employers do not have to aggressively compete for workers. What will be needed is a catalyst to shift the sentiment in the market away from its current, "The economy is on the mend with slow but steady growth and no inflation" to one of, "The economy is growing strongly and inflationary pressures are building". When we might get this sort of shift in sentiment is unclear to me as I no more know the future than the next guy. But I do now believe that is what will be necessary to see gold recapture its allure. I suspect that if and when we get such a scenario as the latter one, we will also see the US Dollar weaken. The problem for gold is that as long as the Dollar remains strong, the "anti-dollar", is not going to be sought after as a refuge. I am noting that even though we are seeing this weakness across many of the commodity markets and in the GSCI in general, gold is holding support fairly well right now. I wonder, if perhaps gold might just be sniffing out some improvements in the US economy and anticipating such a change. I think its reaction to tomorrow's jobs number might be very informative in this regards. If the market does not completely fall apart if we do happen to get a very strong jobs number, it could be that gold is anticipating this improvement in the consumer's well being as the job market improves. We'll just wait and see what we get and go from there. TF Metals Report: Where is the German gold? Note: Change in Total Tonnes from yesterday’s data: SPDR subtracted 1.5 tonnes. COMEX Gold Trust (IAU) Total Tonnes in Trust: 161.83: No change from yesterday’s data. Silver Trust (SLV) Total Tonnes in Trust: 9,909.49: No change from yesterday’s data. Allied Nevada’s (ANV) record sales and production, Banro’s (BAA) production update, Nevsun’s (NSU) production results, Golden Star’s (GSS) production results, Goldcorp’s (GG) production results, and Endeavour Silver’s (EXK) production results were among the big stories in the gold and silver mining industry making headlines today.